This pet radiates darkness as a continual animation. Quite a cool effect. It seems to me that the H/P flavor of this pet is ideal since it benefits more from the damaging abilities. Four out of six abilities do damage. That leaves Phase Shift (avoidance), and Siphon Life (small damage and heal) which also benefits from a higher power. This magic pet can wreak havok on a human opponent using Shadow Shock, Siphon Life, and Curse of Doom. Still very good vs a flyer with Arcane Explosion and Soulrush. 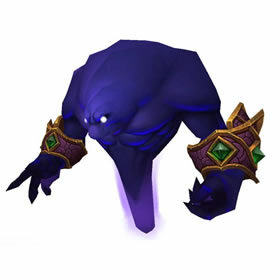 This pet will actually say some of the same quotes as a warlock's voidwalker when summoned. A fun little tidbit for a demonology lock that hasn't heard their old tank's voice in so long. Mine's breed is B/B.